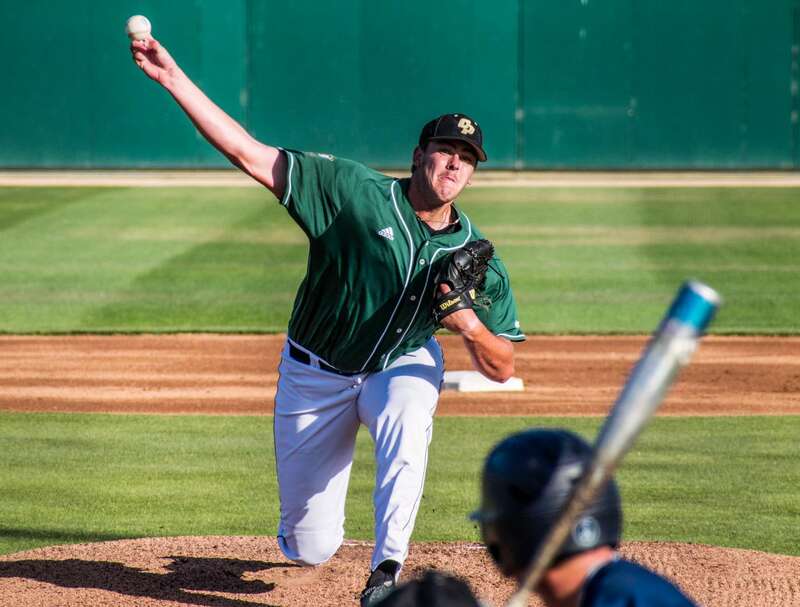 The Cal Poly baseball team fell from second place in the Big West to a fourth-place tie with Hawai’i and Long Beach State after dropping two of three games last weekend to UC Irvine. The Mustangs took an early 1-0 lead on a double by senior designated hitter Elijah Skipps that scored sophomore right-fielder Bradley Beesley. However, the Anteaters tied the game 1-1 in the fifth inning with an infield single. UC Irvine took the lead in the top of the sixth inning with a sacrifice fly by Matt Reitano scored the go-ahead run for the Anteaters. In the bottom of the seventh inning, Cal Poly nearly tied the game as junior shortstop Kyle Marinconz singled to center field but junior center fielder Alex McKenna was tagged out at home plate to end the inning. UC Irvine extended their lead in the top of the ninth inning on an RBI single by Cole Kreuter to give the Anteaters a 3-1 lead. Mustang senior starting pitcher Trent Shelton (4-3) took the loss despite allowing just two runs on 11 hits in six innings pitched. McKenna went 4-for-4 Saturday night, earning his third four-hit game of the year and the fifth of his collegiate career. Freshman right-hander Taylor Dollard picked up the win for the Mustangs, only allowing two hits in the last 4 2/3 innings he tossed after relieving freshman right-hander Darren Nelson in the fifth inning. The Mustangs starting off strong, sending three runs in the first inning alone. A double to right center field from Marinconz brought McKenna to home plate and put Cal Poly on the scoreboard. A single to left field by Skipps and a throwing error from the Anteater’s outfield allowed Marinconz to score. To end the first inning, Beesely grounded out to second base, but junior catcher Nick Meyer still had time to score an unearned run to put the Mustangs up 3-0. Skipps added another run for the Mustangs after he crushed a ball to right center field for his first and only homer of the series. The Anteaters put up three runs to narrow the gap, but Cal Poly ultimately took the second game of the series 4-3. The final game of the series began by honoring the upcoming retirement of UC Irvine’s head coach Mike Gillespie. Gillespie coached the Anteaters for the last 11 seasons, during five of which he successfully brought the team to postseason play, including the 2014 College World Series Championship. UC Irvine took the third and final game of the series 4-1 as relief pitcher Jordan Bocko pitched four scoreless innings allowing only two hits and no walks. Bocko took the win over Cal Poly junior right-hander Michael Clark whose score now sits at 3-6. The Mustangs only used two pitchers that afternoon as Clark started the series and pitched 4 1/3 innings before he was relieved by senior right-hander Austin Dondanville. Dondanville went on to pitch 4.2 innings allowing just a single unearned run. The Mustangs’ only run came in the bottom third inning when Meyer singled up the middle to score freshman infielder Nick DiCarlo. The Mustangs’ offense then stalled, stranding freshman third baseman Tate Samuelson and Marinconz in scoring position.